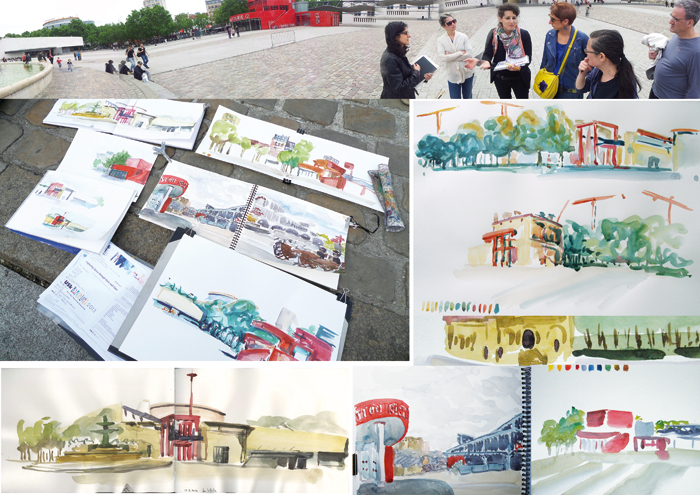 4th International Urban Sketching Symposium: A test for my Workshop Capturing Space through Form and Color. A test for my Workshop Capturing Space through Form and Color. Hello from Paris, France - I am Marion Rivolier. Only three weeks before the Symposium, I can't wait to meet all the participants! For a couple of weeks, I have been working on my workshop and a kind of booklet I want give to the participants. 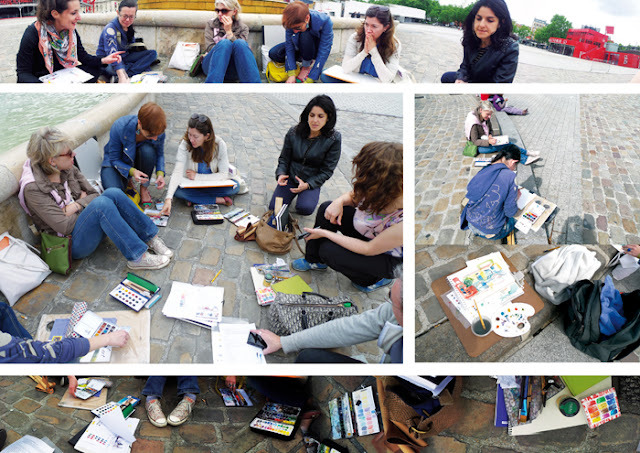 So last Saturday, we made a test for my workshop « Capturing Space through Form and Color ». I invited 7 volunteers to meet in front of the Fontaine aux Lions de Nubie in the Parc de la Villette. This is a large place with a lot of choices of nice points of view. I wanted test the continuity of my exercises and time the session. I wanted to do this test in English to practice and all the participants played the game! It was very funny and a little stressful for me! The rules of the day were: bring a box of watercolors with some basic colors, a big brush and a watercolor sketchbook in the landscape format, NO PEN, NO PENCIL, NO BLACK. Thank you so much Kim, Flo, Fleur, Laureen, Krytzia, Fabienne and Sébastien for your participation, your great work, your good mood and your comments on my workshop. It was very interesting for me. Fleur made the panoramic pictures. Thank you Fleur! You can see some watercolors from Flo, Fleur, Fabienne and Laureen, thank you girls! I am very happy to be meeting you in Barcelona and painting with you! Great results! Looking forward to meeting you, Marion, and I can´t wait to take your workshop! I cant wait for your workshop Marion...LOVE you work so much! Thank you Nina and Liz. I am also looking forward to meeting you and working and sketching with you! I love seeing these test workshops - looks fun! I was in Pais for the test of this workshop, It was GREAT, I learnt a lot! I am sure you will have fun following this workshop!